Several University of Illinois Springfield students were honored during the annual Model Illinois Government (MIG) simulation at the Illinois State Capitol this weekend. 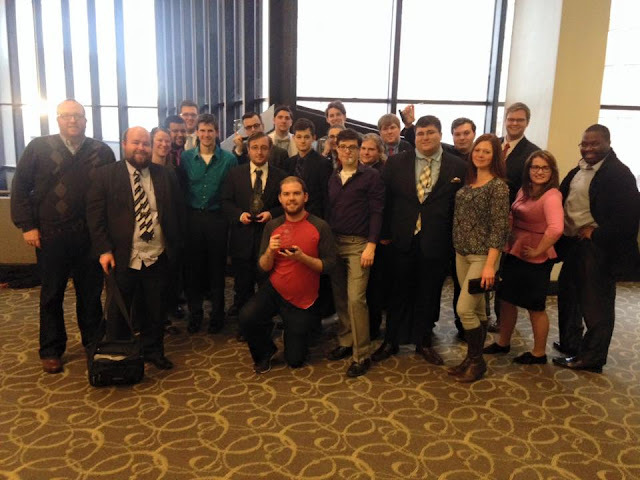 The UIS group also received the overall award for Outstanding Large Delegation. Four students won individual awards for their involvement in MIG. Marc Reiter of Minonk was honored with the Outstanding Contribution to MIG award, Thomas Clatterbuck of Jacksonville won Outstanding First Year Delegate in the Senate, Cole Moriarty of Algonquin won Outstanding House Committee Member and Austin Mehmet of Springfield won Outstanding Moot Court Attorney. UIS student Simon Andrews of Springfield was elected to statewide office within the Model Illinois Government organization and will serve as Secretary of State. UIS alum David Jones of Richton Park was elected to executive board as Chief Justice. Thomas Clatterbuck of Jacksonville was elected Senate Assistant Minority Leader, Michael Dahmane of Springfield House Assistant Minority Leader, Kaelan Smith of Clinton House Minority Whip, and Cole Moriarty of Algonquin House Majority Whip. Each year, students from over 20 colleges and universities around the state gather at the Illinois State Capitol to serve as legislators, staffers, lobbyists, journalists, and officials of the executive branch. Through committee actions, a regular legislative session and a veto session, participants learn the legislative process by doing it.